The North Marion wrestling program wrapped up its final home event on Jan. 23, hosting the Banks Braves and Tillamook Cheesemakers while celebrating the Huskies' senior wrestlers. Led by seniors Saul Tarula (160 pounds), Avidan Sanchez (145) and Wyatt Haberstitch (138), the Huskies beat the Braves 48-30 before falling 64-15 to the Cheesemakers in a three-way that featured teams that placed in the top 10 at last year's state championship tournament. All three seniors scored victories over the Braves, with Haberstitch and Sanchez taking down their opponents by pinfall in the first round, while Tarula went the distance against Johnathan Dudley, scoring a 3-2 victory in the opening match. While Banks enjoyed an advantage over North Marion in the heavier weight classes — including forfeits at the 220 and 285 weights — North Marion won every match from 113 pounds through 170 pounds. Ethan Gianella and Jony Meja picked up first round pins at the 113- and 120-pound classes, followed by a forfeit victory for Cainan Sanchez. Freshman Caedyn Laninga scored a pin in the first round at 132 pounds, followed by Haberstitch and Sanchez. Robert Dominguez added a second-round pin at 152 pounds to finish the event, and Tyler Manning scored a 12-5 decision to round out the Huskies' victories. In the follow-up match, the Huskies were overwhelmed by a Tillamook team that ranks among the best 4A teams in the state this year. Avidan Sanchez picked up an 8-2 win over Sam Connelly, while Laninga scored a pin over Francisco Rosas in 2:52. Cainan Sanchez added a forfeit victory for the Huskies, but the Cheesemakers took every other weight class, winning 10 matches by either pin or forfeit. The Huskies finished their week with a trip to South Albany High School on Saturday to compete in the Mid-Valley Classic, placing fifth overall out of seven teams. Seven of the team's eight wrestlers scored points in the event, led by Avidan Sanchez's first-place finish in the 145-pound bracket. He picked up two victories by first round pin to open the event and scored a 9-4 decision over Junction City's Garrett O'Callaghan to finish the day undefeated. Cainan Sanchez and Tarula finished second in their respective weight classes. Cainan Sanchez went 3-1 on the day, claiming a pair of first round victories in addition to a 19-9 major decision over South Albany's Isaiah Abrao. His lone loss came in a second round pin to eventual champion Evan Potter of Junction City. Tarula was 2-1 in the 152-pound weight class, falling by 4-3 decision to Tanner Gibson of Junction City before rebounding with a pair of first round pins to finish the day. Justin McConkey (113), Laninga (132), and Haberstitch (138) each finished third, while Kevin Guzman (132) and Manning (160) each took home fourth place. 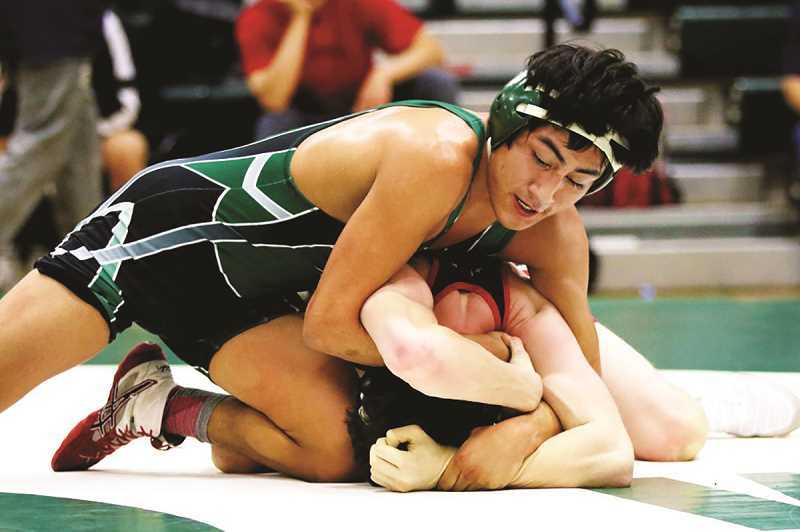 The Huskies wrap up their regular season this week with a trip to Woodburn High School on Wednesday to compete in a four-way dual against the hosting Bulldogs, along with teams from Estacada and Molalla. From there, North Marion sets its sights on the District Championship tournament held at Tillamook High School on Feb. 8-9.